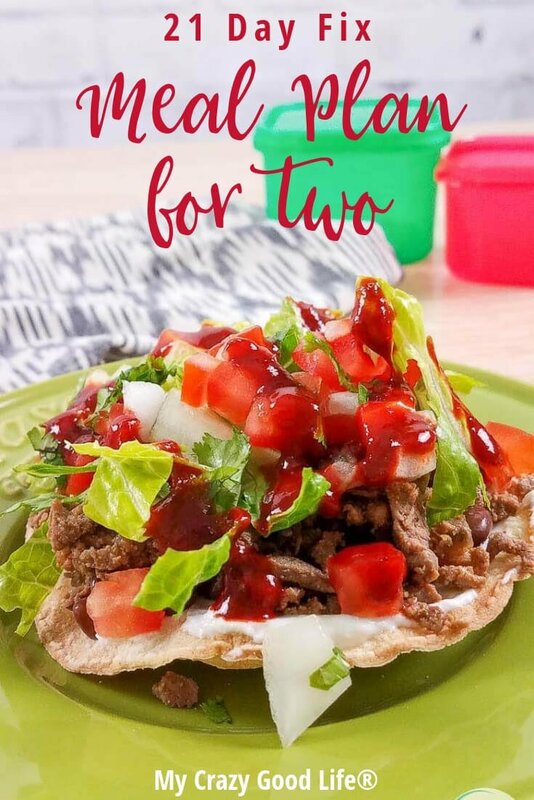 This 21 Day Fix meal plan for two is perfect if you are cooking for yourself or just for two. I’ve found recipes that are easy to cook and freeze half or recipes that don’t make a lot of food. No stress over cooking for one or two and having tons of leftovers that don’t freeze well! I get so used to cooking for the whole family that sometimes I forget what it is like to only have to cook for two! All of these recipes are perfect for those of you who are only cooking for a small amount of people. If you have picky kids these recipes are also great for sticking to your 21 Day Fix plan without having to fight them to eat healthy! You can whip up these 21 Day Fix meal plan for two options for the adults and something more kid friendly for the rest of the family. 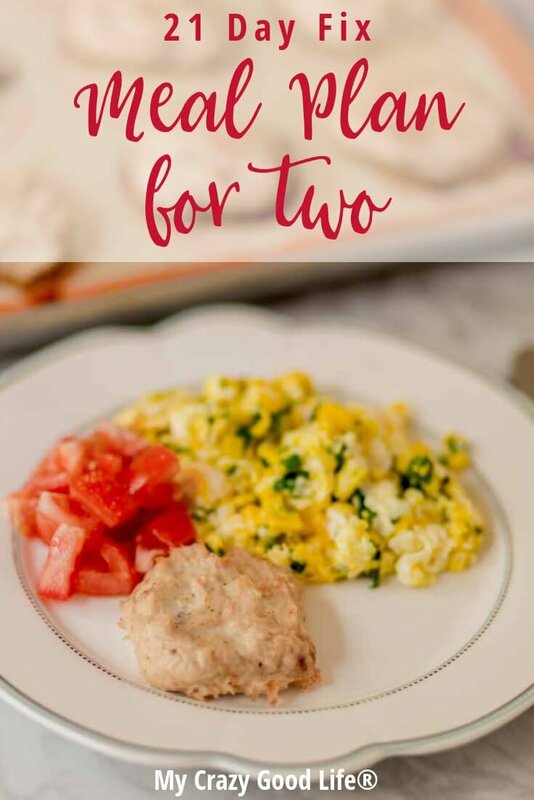 This 21 Day Fix meal plan for two isn’t geared towards any specific calorie plan (you can find those here!). The work went into finding recipes that are easy to cut in half, freeze, and eat throughout the week. This meal plan works best if you cook once a week or every other day and then use leftovers for lunches. If you are worried about being sick of the same thing the next day, you can prep two meals at the beginning of the week so that you have options. Ideally these recipes will be perfect for two lunches and two dinners! Let’s start with the best part: snacks and desserts! Just because you are cooking for a smaller crowd doesn’t mean you have to miss out on all those delicious 21 Day Fix dessert options. I would choose one or two of these desserts and make a batch for the week! It’s the easiest way to make sure you have something healthy on hand to curb those sweets cravings. For snacks, I usually prep a whole week of snacks ahead of time so that they’re ready to go for the busy days. Check out how meal prep can save you time here. Breakfast is the most important meal of the day. When you are prepping for your 21 Day Fix meal plan for two, don’t forget to include some of these delicious breakfast options. I love to meal prep because it makes my life so much easier. If I only end up having to cook one meal every other day, that’s a win in my book! I typically do my meal prep with the Instant Pot once a week. Breakfasts are a big part of that equation. Try making some of these recipes, just one or two will do, and then you have a quick and easy choice for the week! Most of these options, aside from the toast (which is quick and easy to make the day of), will keep for the week. Just one day of prep and you have breakfasts for two, all week long! Chorizo and Egg Casserole This is so easy to freeze! Breakfast Fried Rice Easy to freeze and even better the next day! Wonder Whip Delicious Greek Yogurt treats that can be fruity (key lime and lemon meringue!) or chocolatey. Breakfast Sausage So easy to make a huge batch and pull out each morning. There is a savory one too! Sweet Potato Hash Browns We love these with the breakfast sausage–both are super easy to freeze and reheat. Remember, I left lunches out on purpose. Don’t be afraid to prep one of these dinners on Sunday night so you have a backup lunch in case you don’t want a repeat of the night before. I never mind eating leftovers the next day, mostly because it saves time and means that nothing goes to waste, but I know that’s not everyones favorite thing! Crack Chicken Use it as a dip (it’s a great lunch! 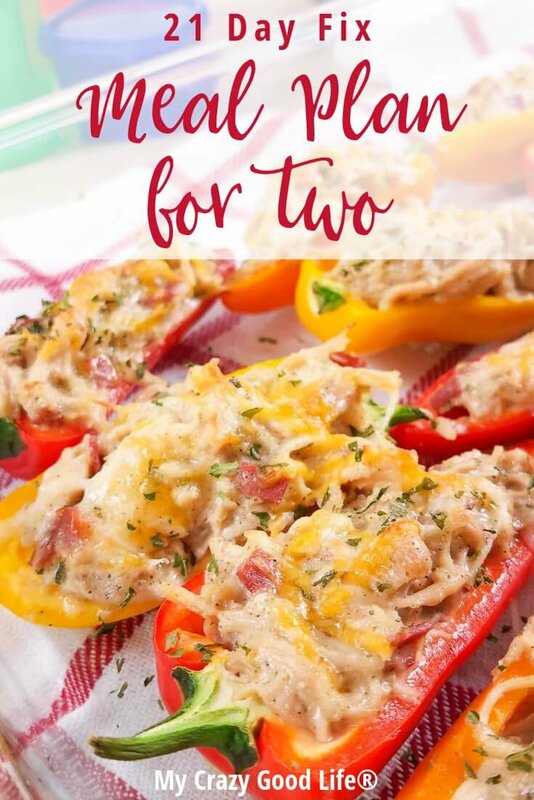 ), or as a filling for mini bell peppers or as a salad topper–this recipe is easy to freeze and thaw. You’ll always want some in your freezer for last minute meals. Turkey Quinoa Taco Bake I love how I can make a huge batch of this and freeze half immediately. It’s delicious on a salad, on top of a bed of cauliflower rice, or in a tortilla! Make this Carne Asada once and enjoy several leftover meals that are super easy to make (recipes are all in this post). Chipotle Chicken Marinade I add this to a freezer bag with frozen meat and as it thaws, it marinates. It’s great for salads! Hamburger Helper I love how easy this is to freeze and reheat! 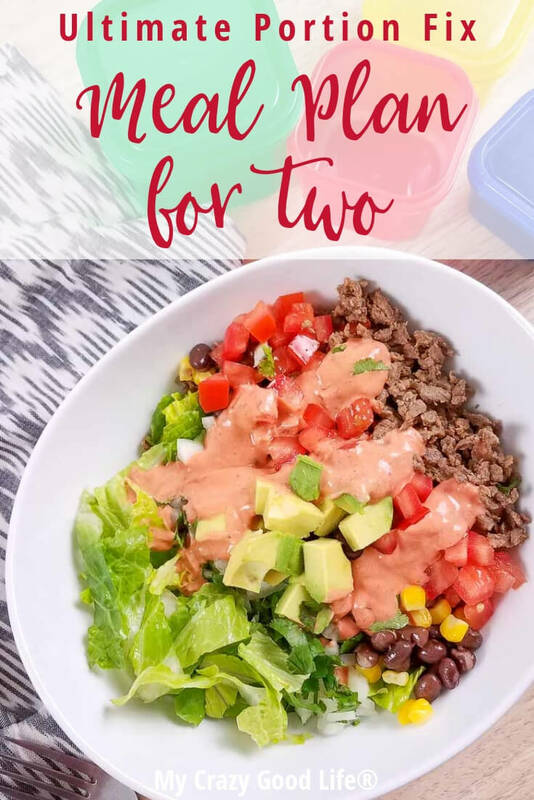 Burrito Bowls This recipe makes a ton and can be customized easily to what is in season for toppings. Mississippi Pot Roast Make this, have a nice dinner, then freeze the rest for later because it makes delicious burritos! Enchilada Bake Make a batch and use as a salad topping, enchilada filling, or as a dip! It’s easy to freeze, too. Cream of Mushroom Soup Make a few batches and freeze individually so you can ditch the canned stuff.